Part 2 of Epcot’s “Food and Wine Festival” 2015 covers more vendors and of course, food. There were so many unique options to choose from! 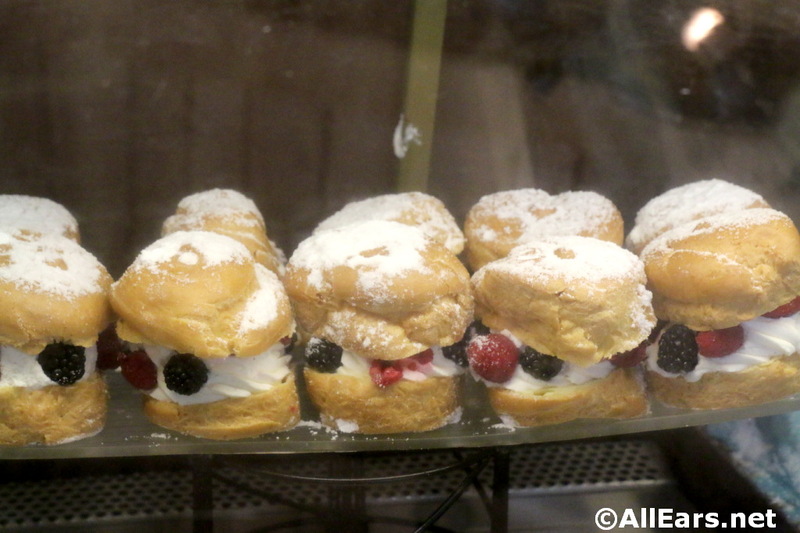 Kingla Bakeri Og Kafe / Berry Cream Puff , this puff pastry was filled with whipped cream and fresh berries. This sweet treat was a generous portion full of delicious berries. The Japanese Pavilion is one of my personal favorites. The gift shop is filled with the coolest stuff! Kabuki Café / Rainbow Kakigori is Japan’s version of shaved ice with mixed flavors. Kabuki Café / Frozen Kirin beers! We couldn’t choose so we had to order all 3 Belgium waffles and give them a try. I was surprised to find that my favorite one was the potato and leek waffle. I really enjoyed the sweet toppings on the other waffles too. If you think about it, a waffle is pretty much like a blank canvas — you can add just about anything on top of it. Brazil / Crispy pork belly with black beans and tomato. To wash it all down, the Kaiser Brewery Xingu Black Beer. L’Artisan des Glaces. This new spot has lots of sweet goodies such as fresh ice cream and sorbet. I ordered the mango sorbet. You can really taste the authentic mango flavor. My friend, Emily, ordered the Pumpkin Spice Macaron Ice Cream Sandwich. France / Croissant aux escargots with garlic and parsley which is styled a lot differently than last year’s festival. It was really awesome hanging out with the Julius, Odessa, and Emily. As I always say, “Sharing is caring.” It’s also the best way to try a bunch of dishes while saving a bit of money. Julius and Odessa with their matching shoes. Make sure you follow our IG @maihiroteam and my friend @droolius for positive comments and support.